Alpine Garden Society Shows are a good way to come across unusual plants. It was at an Ulster Group Show many years ago that I first came across Jeffersonia dubia in flower. It had been grown by Rev David Lapsley and I was immediately impressed by it and set out to acquire it. Fortunately it is readily available through seed exchanges (Scottish Rock, Alpine Garden Society and North American Rock all had it in 2011/12), as well as nurseries (the Plantfinder lists twelve in Britain and who do mail order). My seed was sown in January 2001 and I eventually was able to grow on three plants (I have lost one through my own carelessness about watering). There appears to be no great problem growing Jeffersonia dubia as long as you use a humus-rich compost. It is a spring flowering woodland plant of North-east Asia. With me the first leaves appear in March and have a very pleasing purplish tinge that sets off the lavender blue flowers nesting underneath them (the leaves later turn green). Indeed I have put the plant in the section for foliage plants at AGS Shows with good results. I have always kept it in a pot in a partially shaded greenhouse the better to appreciate it – if outside the flowers would only be a few inches off the ground. Later on the leaves will elongate to about 12 inches. Appreciate the flowers when you can as they only last a short time – you are talking about 5/6 days before the petals fall !! There is a white-flowered version but I like the lavender blue. 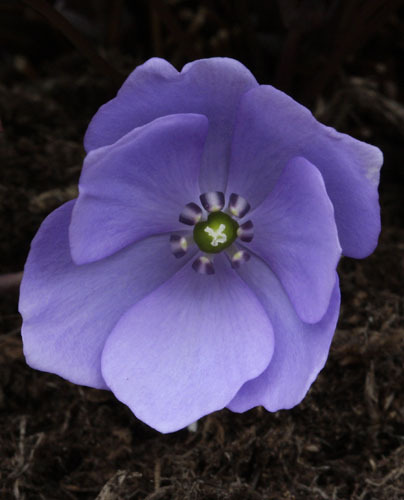 Jeffersonia is a small genus. 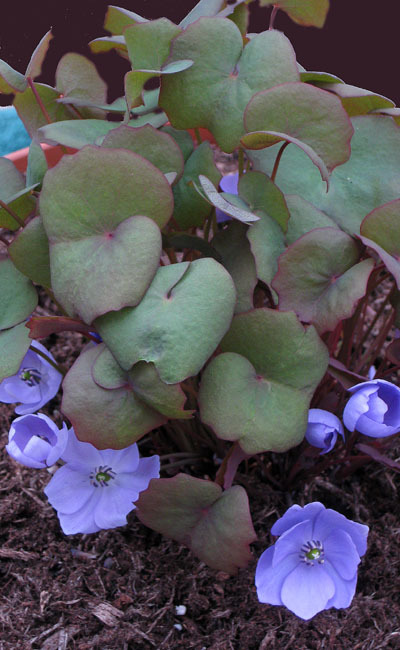 The only other (Jeffersonia diphylla) comes from North America and I will have to try it next.